One of the special delights of attending the Rossini Opera Festival in person is coming in contact with other Rossini lovers from around the world. This summer a number of them spent hours at breakfast at one of the Pesaro’s welcoming hotels discussing the events of the previous day. Among them was Jürgen Gahre, a knowledgeable and personable journalist from Germany, who was also busy posting his reviews. He graciously agreed to share it with Rossini America, and thanks to the assistance of his friend Boyd Mullan provided us with this translation. We think you will enjoy the excerpts from his review. A link to the full review is posted at the end. “If you haven’t yet laughed in your whole life,” the great French novelist Stendhal advised a grumpy, puritanical Englishman two hundred years ago, “then go to Naples and see Rossini’s La gazzetta.” Today however he would have to go to Pesaro, for what director Marco Carniti has deftly conjured up on the stage of the Teatro Rossini is hilariously funny and so lively that the three-hour opera just flies past. Carniti makes do with a long catwalk made up of interchangeable parts and achieves fine effects with fanciful costumes in the style of the fifties and an expressive use of lighting. It is well seen that Carniti comes from the world of ballet for the colourful action on the stage has a dance-like lightness, especially in the lively ensemble scenes. One witty idea follows hard on the heels of another and with every addition the Rossinian roulades come faster and faster right up to the ecstatic climax. All of this finds its visual counterpart down to the tiniest detail: newspapers fall in long lines from above, letters are sent whirling around to make ever more new words, all of a sudden the stage turns into a boxing ring — with scant resources great effects are achieved! What exactly happens in La Gazzetta, which was composed in 1816 for Naples? The rich, puffed up Don Pomponio has had the absurd idea of advertising for a husband of appropriate social class for his daughter Lisetta. She however has long since decided on Filippo, the charming owner of a hotel in Paris, and then when a self-important Madama La Rose and another father with his daughter turn up in the same hotel with similar matrimonial intentions the stage is set for all sorts of errors, entanglements and confusions. 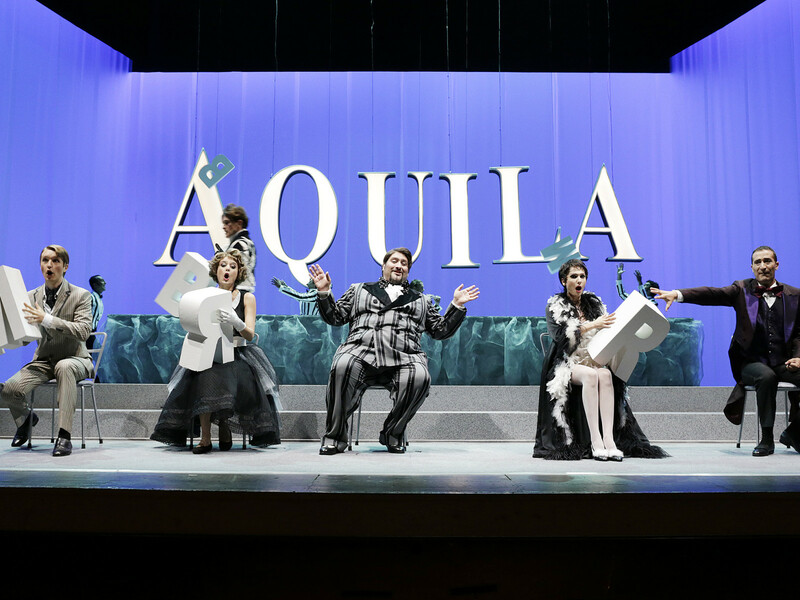 A good performance of La Gazzetta stands or falls with the casting of the part of Don Pomponio, and this is something that Pesaro is well placed to provide, for Nicola Alaimo is a buffo artist to his fingertips. He employs his great physical bulk to extremely comic effect, in order to underline the ridiculous pomposity of this deranged rich man. Carniti has him accompanied constantly by the mute Tommasino (a character that does not figure in Rossini) who serves the Don with slavish obsequiousness and interprets the will of his master by means of gestures and acrobatic-type contortions. An absolute triumph of the director’s art! Enrique Mazzola guides the orchestra of the Teatro Comunale di Bologna with great verve through the score and captures perfectly its ‘Prosecco’ spirit and all the delightful absurdities of a musical work that simply bubbles over with joie de vivre. Accordingly Hasmik Torosyan in the role of the strong-minded Lisetta is able to deploy her brilliant, crystal clear soprano voice to optimum effect, Vito Priante (baritone) is the subtlest of Filippos, and Maxim Mironov as a lovesick Alberto is an engagingly bright and flexible tenor. When at last the turbulent action approaches its climax, when the comedy reaches the level of absurdity in the whirling confusion of the closing scene and everyone has been touched by the magic wand of Rossinian madness, the right moment has arrived for a political message. Marco Carniti demonstrates the need for culture by means of a masterly coup de théâtre which reduces the unspeakable, oft quoted statement of the Italian finance minister Tremonti that culture is really superfluous (Con la cultura son si mangea) to absurdity. The audience showed its gratitude to all those who took part with frenetic applause. The undeservedly seldom performed Gazzetta has been brilliantly rehabilitated by this outstanding interpretation. ← ROF’s La Gazza Ladra on “World of Opera” with our gift to you!